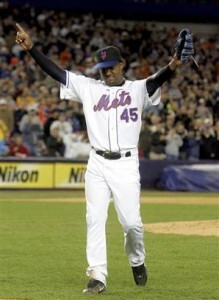 Pedro Martinez was a fan favorite in Flushing. Two years after he threw his last pitch, Pedro Martinez plans to announce his retirement from major league baseball. There’s no question Pedro was one of the game’s most dominant pitchers in his prime. He won a total of 219 games and won 3 Cy Young Awards along the way. What’s more impressive is that he dominated a hitters’ league during the steroid era. He posted sub-1.00 WHIPs 6 times from 1997-2005. He struck out 200 or more batters all but once from 1996-2005, including two years of over 300 Ks. His best season came as a member of the Boston Red Sox in 1999, a season in which he posted a 23-4 record with 313 Ks, and a microscopic 0.74 WHIP. Though he played for several teams, he’ll always be known for his exploits with the Red Sox. But what is his legacy with the Mets? Can his 4 years in Queens be categorized as a success or failure? GM Omar Minaya inked Martinez to a 4-year $53MM deal following the Sox’s 2004 World Series victory. Many questioned the contract, especially the length, since there were already rumblings about Pedro’s health, and the slowing velocity of his fastball. However, the early part of his contract was a success. Martinez gave the Mets a certain amount of “cred” among other players in the league. Many believe the Martinez signing helped to lure Carlos Beltran to the Mets that same winter. And perhaps Carlos Delgado the year after. On the field, Martinez was close to vintage in 2005. While he never threw as hard as he did during his prime, a 92-93 MPH moving fastball set up his changeup and curveball beautifully. He went 15-8 with a 0.95 WHIP and 208 strikeouts. He completed 4 games that year, which was a great help to the weak bullpen led by the team’s mediocre closer, Braden Looper. Red flags were raised as he was shut down in late September, with the Mets out of the race. The focus on Pedro’s sore right toe was a dominant and surreal story throughout the offseason, and into the Spring. Questions of his health waned after Martinez got off to a 5-0 start in 2006. But he began to break down, first suffering a hip injury while slipping on the clubhouse steps. His performance steadily declined as his trips to the Disabled List increased (He had a total of two stays on the DL). He went 4-8 the rest of the year, and was seen crying in the dugout after a miserable outing in September. An MRI revealed he had been pitching with a torn rotator cuff and a torn calf. His season was done, and his career was threatened. Martinez rehabbed, and made an admirable comeback in September of 2007. He went 3-1 with a 2.57 ERA, though his stuff was clearly not what it was. In 2008, he strained his hamstring in his first start, and missed most of the season. He totaled a 5-6 record with a 5.61 ERA. He would go on to pitch one more partial season with the rival Philadelphia Phillies in 2009. So how does one measure Pedro’s time with the Mets? Off the field, his credibility with the rest of the league helped to build the contenders of 2006-2008. But his health issues marred his performance on the field. Think of how different the 2006 postseason could have been with a healthy Pedro in the rotation instead of John Maine, Oliver Perez, or Steve Trachsel. A healthy Pedro might have helped stave off the collapses of 2007 and 2008. But his body betrayed him, and the Mets pitching staff suffered. The teams of 2006-2008 were ultimately disappointments, and unfortunately, so was Martinez. The disappointment wasn’t necessarily his fault – Minaya and the Wilpons took a chance on a declining superstar. It was a gamble that payed off early on, but in the long run didn’t meet expectations. Despite his performance, Pedro will remain a fan favorite among the Mets faithful. He showed guts and a competitive fire. He was refreshingly honest with the media, and the fans loved his entertaining personality. And when you boil it down, baseball is about entertainment. So maybe Pedro’s legacy with the Mets wasn’t a total loss.